Samsung Electronics launched its new curved monitor line-up including CF591 (27-inch model) and CF390 (23.5- and 27-inch models). 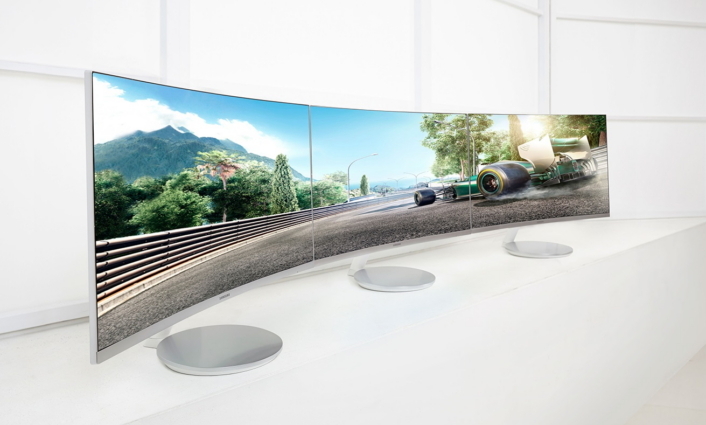 Samsung’s newest curved displays meet the diverse multimedia and multitasking needs of both professional and individual users, and foster a visually-comfortable environment conducive to long-term use. Since releasing the industry’s first curved LED monitor in 2014, Samsung has continued to refine its design to accommodate growing demand from various user groups. The new CF591 and CF390 monitors feature many of Samsung’s latest innovations, including a sharper curve (1800R, translating to a curvature radius of 1,800 mm) and improved picture quality to deliver an optimal presentation that matches the shape of the human eye. Samsung will launch the new curved monitors in the US, Europe and Asia in March and will expand the sales to other regions by April. All of Samsung’s new curved monitors include a host of features that further reduce reflectance and visual fatigue, enabling users to view their screens for longer periods. The CF591 and CF390 displays leverage Samsung’s flicker-free technology to prevent interruptions that can strain users’ eyes. A complementary Eye Saver Mode setting further protects audiences from exposure to harmful blue light emissions. To benefit gamers and at-home entertainment users, all three displays include embedded AMD FreeSync™ Technology over HDMI® functionality that synchronizes screen refresh rates with users’ AMD graphics cards to reduce input latency, stutter and lag when viewing interactive video content. To deliver a more uniform presentation, Samsung’s CF591 and CF390 monitors offer a wide 178-degree viewing angle. This expanded visibility ensures that users can enjoy the full visual detail scope from multiple locations in the room, with less eye movement required. By combining its optimized curvature and wide-angle viewing with premium color presentation and accuracy maintenance features, Samsung’s curved displays bring even the most minor visual details to life – even in traditionally environments for watching movies and playing video games. The displays’ 3,000:1 static contrast ratio is nearly three times higher than that of standard monitor alternatives, and presents content with deeper blacks and more pristine whites. 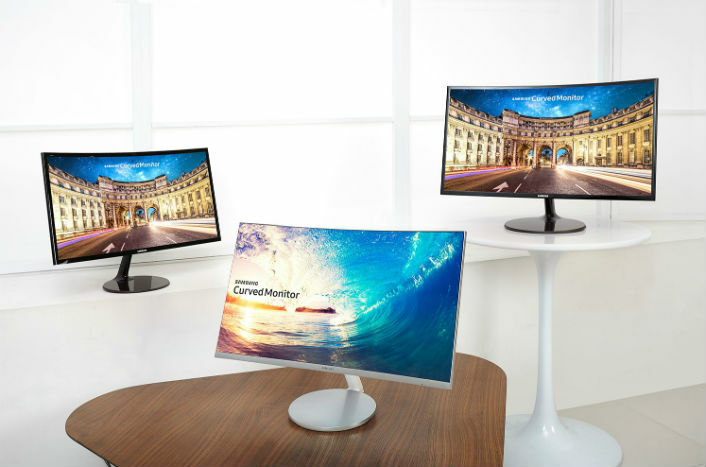 All three curved monitors are reinforced with Samsung’s industry-leading Vertical Alignment (VA) panel technology to reduce backlight bleed and produce a more complete, high-quality picture. To further amplify image detail, Samsung’s active color crystal technology supports sRGB 119 percent coverage within the CF591 monitor. This feature enables the CF591 to present a wider range of color hues and values than conventional displays allow, and share a more vivid picture with audiences. For gaming users, Samsung’s Game Mode setting automatically adjusts picture conditions to become lighter or darker as dictated by gameplay, while also minimizing screen stuttering and tearing. These benefits, combined with the displays’ tight curve radius, give gamers a sense that the screen is surrounding them to inspire a more realistic experience. The CF591 monitor recently earned safety, quality and performance validation from UL (Underwriters Laboratories) following a rigorous testing process that evaluated its curved design, color presentation and viewing angles. Samsung’s CF591 and CF390 curved monitors feature a boundless, thin-bezel design that eliminates viewing borders and draws audiences into a distraction-free environment. This sophisticated boundless design facilitates the illusion that on-screen content is floating in mid-air and fosters a more immersive and captivating presentation. Additionally, Samsung’s new monitors are built to be both practical and attractive, making them a compatible addition to any desktop or home entertainment setting. All three displays feature a metallic silver front and glossy white back that accentuate their curved structure. A circular stand elevates the look of the displays’ base while simultaneously providing stable support. Likewise, CF390 users can easily adjust their screen to the ideal height and viewing angle with the displays’ ergonomic tilt and swivel components. Through amplified sound quality and versatile connectivity, the CF591 and CF390 displays transform on-screen content into a multi-sensory experience. The CF591 monitor features built-in dual 5W speakers that deliver enriched sound quality while preventing speaker and cable clutter on desktops. All three monitors also provide easy connectivity and seamless visual continuity for users’ PCs and gaming consoles through an embedded interface containing HDMI, D-Sub ports and Display Port (only for the CF591).